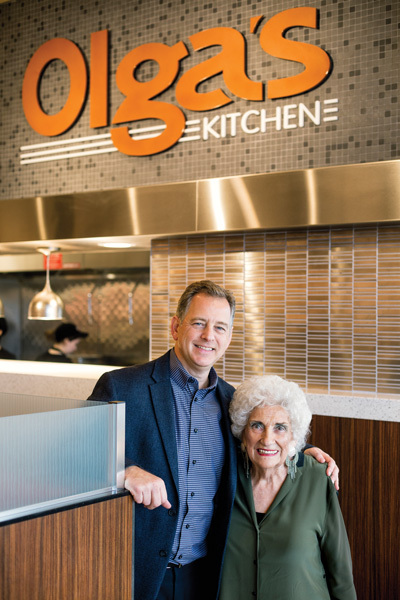 Olga’s Kitchen Inc. embraces its past to chart a new future. Before Olga Loizon launched Olga’s Kitchen Inc. in 1970, she had to convince her husband that the concept of selling flatbread sandwiches, salads, and spinach and cheese pies from a 10-by-10-foot stand in the former Continental Market in downtown Birmingham was a viable business model. “He wasn’t in favor of opening a restaurant, but I told him our (three) children had reached their teenage years and I needed something to do,” says Loizon, who, at 90, has a personal services contract with the chain of 25 restaurants (a new location will be added in Shelby Township by April). In 1969, returning by ship from a yearlong trip to Greece — where her children attended school — Loizon carried in her luggage a machine she had purchased so she could continue to make the types of sandwiches her family had enjoyed at a local eatery. “They loved them, I loved them. So I started putting together the business plan in my head,” she says. To get started, she applied for a $3,000 loan from Detroit Bank and Trust. The financial institution approved the loan, as long as her husband would be a co-signer. He declined, so Loizon raised $1,500 and took out a loan for the other half of the startup money (from the same bank). Over time, Loizon expanded the Birmingham location from basic counter service to include tables and chairs, and eventually she added other restaurants. She sold the business in 1976, but has mostly stayed involved in the operations since then. The business proved resilient until a group of owners in California acquired the company. After rolling out a new concept in Auburn Hills in 2010, the company began to falter. The chain filed for Chapter 11 bankruptcy in June 2015. At the time, it reported between $1 million to $10 million in assets, and around $12 million in liabilities. Enter Team Schostak Family Restaurants in Livonia, which jointly owned 11 of the restaurants prior to the bankruptcy. The company, which owns 66 Applebee’s restaurants, five MOD Pizza locations, and four Del Taco eateries, paid more than $11 million for Olga’s Kitchen late last year.